Vinpower has successfully launched our own line of optical discs, flash media (including USB), and will now launch a new line of Optiarc SSD drives. By performing strict and intensive quality control standards to weed out any defective or substandard media, Vinpower can ensure 100% reliability with 0 defects. When you’re dealing with hard drives like SSD that store critical and irreplaceable content, you can’t afford to take any changes. 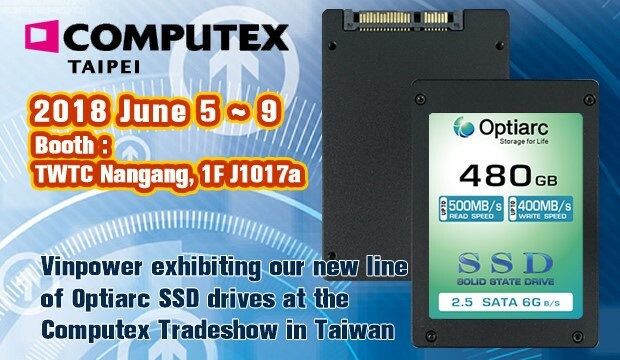 To get a first look at the new Optiarc SSD drives, please make an appointment today to visit Vinpower’s booth, June 5th – 9th, 2018, located at TWTC Nangang, 1F J1017a. For more details about archival storage or any product in the Vinpower offering, please visit our website at www.vinpowerdigital.com, or contact a representative near you. Archival discs are the best option for cold storage as digital content providers look for the most effective way to reduce volume on their server farms. Every time you send an email, post a picture on social media (like Facebook), or send a snarky message through Twitter, and so on, you leave a digital footprint that is kept and stored by the platform you’re using. That means that companies like Facebook, Google, WhatsApp, etc. need to maintain adequate server farms to hold not just recent data storage, but also years of previous data. That old content is referred to as “cold data” because it’s rarely retrieved and essentially on ice until it’s needed again. Since cold data is not accessed frequently, to free up space for current and future content, the cold data is often offloaded onto another digital platform that can be easily stored, retrieved, and doesn’t take a lot of space, both physically and electronically. That makes optical discs the ideal storage medium for Cold Data as it fulfills all of the requirements. In 2016, the thinktank IDC concluded that the world’s data storage stood at 16ZB, (that’s Zettabytes, with a “Z”, which is 1 trillion Gigabytes, that’s trillion with a “T”). Based on current and expected future internet usage, the IDC anticipates that number to increase to 163ZB’s by 2020. 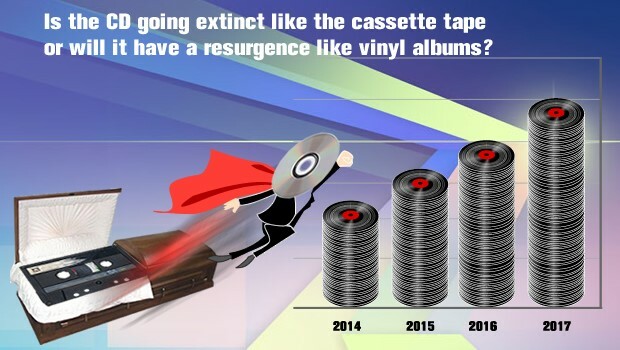 That means in 4 short years, we would have all contributed nearly 150 more Zettabytes or 150 trillion GB’s of digital content held in electronic storage. Based on these numbers, it’s expected that even if only 10% of that content needs to be offloaded onto Archival Discs (AD), which currently hold 300GB each, it would take roughly 800 million AD’s to hold that content resulting in a windfall of approx. USD $3 billion in revenue for the company(ies) that can tap into this growing market. That is just the tip of the iceberg in terms of potential for the AD market. So, this is the perfect time to get in and take advantage of the future of the optical evolution. That is just the tip of the iceberg in terms of potential for the AD market. So this is the perfect time to get in and take advantage of the future of the optical evolution. For more details about this product or any product in the Vinpower offering, please visit our website at www.vinpowerdigital.com, or contact a representative near you. If you’re planning to attend the 2018 Computex trade show in Taiwan, taking place June 5th through 9th at the Taipei Nangang Exhibition Center, we invite you to schedule an appointment to meet with us during the show. 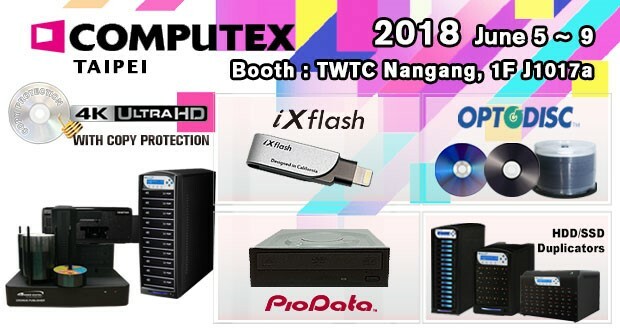 Vinpower’s booth will be located at TWTC Nangang, 1F J1017a, where we will be showcasing our Duplication grade media, hardware and the latest advances in duplication writer drives, professional line of flash and HDD/SSD duplicators and introduce a new series of flash drives and related products, including the iXflash. To fully appreciate all the new and improved products Vinpower will showcase, you’ll certainly have to visit and see for yourselves. Computex is one of the largest CE and ICT expos today, and attracts visitors from all over the world looking for technology products and partners. Vinpower has exhibited at Computex for over 10 years and has seen first-hand how much it’s grown. If you plan to attend Computex, this is a great opportunity to schedule an appointment to visit our booth to see our latest product offerings and how we can help your business grow within the duplication and memory market. We will be located at Booth # 1F J1017a inside the NangGang Exhibition Hall of TWTC. The new Daisy Chain towers boasts an upgraded controller and connections between systems, which enables the individual towers to not only burn faster, but also smoother and easier than the original models. In creating a smoother burning process creates a more stable duplication environment dramatically reducing the risks of failed burns across the towers. Even if there is one or two failed burns, the new daisy chain duplicators will not allow those failed burns to negatively impact the rest of the drives across the other towers in the chain, maintain a much higher success rate. To schedule an appointment for a meeting during Computex, or for more details about the many product offerings available and upcoming, visit www.vinpowerdigital.com, or contact a Vinpower representative today.